US, 2009, 107 minutes, Colour. Jesse Eisenberg, Kristen Stewart, Ryan Reynolds, Kristen Wiig, Bill Hader, Martin Starr. Adventureland is a rundown entertainment park in Pittsburgh. 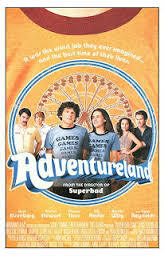 The film is not really about Adventureland. It is the location where most of the characters work and provides a setting for a group of older teenagers sorting out their lives (and making mistakes, of course). The film was written by director Greg Mottola (The Daytrippers, Superbad) and is set in 1987 – it has more than a few autobiographical references. Jesse Eisenberg plays James, a bemused, intelligent, confused adolescent (as he has done so often, to good effect, in films like Rodger Dodger, Cursed, The Squid and the Whale). He has an entry to Columbia University but his father has fallen on hard financial times and the family doesn't have enough money. His summer trip to Europe is off and he has to get a job, unqualified, and finishes up on the games stands at Adventureland, not on the rides which he would like. Bill Hader plays the eccentric owner of the park. A rather morose girl at the neighbouring stand, Em, attracts his attention (Twilight's Kristen Stewart) and she helps him in a difficulty with aggressive unsatisfied customers. A principled young man concerning depth of relationships, he becomes friends with her, confides in her and gradually realises that he has fallen in love with her. Not that easy. Unbeknownst to him, she is in a relationship with the park's married handyman (Ryan Reynolds). There is also the park's glamorous attendant who makes a minor play for James. Crises. Well played, with more realistic characters than so many in current films about teenagers and coming of age. 1. A memoir from the writer-director? Teenage in the 1980s? Life, life issues? From a 21st century perspective? 2. A portrait of young adults, their lives, prospects, hopes, disappointments? Relationship with parents? Support from parents, family, friends? Jobs? Job friendships? Emotions, love? 3. The serious and comic tone of the film? Real? 4. The Pittsburgh settings, the city, homes, motels? Adventureland itself? Authentic? The musical score – and the range of songs from the 1980s? Capturing the mood? The lyrics? 5. Adventureland itself, the tawdry look, the games, the rides, offices? The staff, the various personalities, jobs? Interactions, friendships, clashes? The details? The music? Adventureland as a place for learning about life, people, relationships? 6. James, Jesse Eisenberg’s screen performance and style? Hesitant? His studies, achievement? His hopes for the trip to Europe? His studies? His parents, the father and his drinking? No money? The scene of his learning that he could not go to Europe? His planning to go to Colombia? Journalism? His friend, the job, the applications? Sensitive – serious, and overqualified for his job? 7. The portrait of Adventureland, Bobby, Paulette? Their running the theme park? Their relationship? The games, their rules, clients? The racing? The critiques? 8. Em, her age, experience, the work at Adventureland? Her relationship with Mike Connell? The secret? Her own self-image? James, friendship with her? Their talking together, bonding, the outings? The lyrical scene – with Joel and the watching the fireworks? The drugs? The dodgem cars? 9. James, age, sexual experience and lack of it, his falling in love with Em rather than as in so many American comedies, lusting after her? His learning? The disillusionment about her relationship with Mike? 10. The owners, their character, interactions? Their taking on James? Allotting the tasks to him? Their relationship with the rest of the staff? The prospects for Adventureland? 11. Mike, his life, his breaking up with his wife, the relationship with Em? His serving as a mentor to James? James learning the truth? Mike and his future? 12. The range of characters at the theme park, Joel, the comedian? The range of clients, the people coming to the park, character sketches? An authentic feel? 13. An insight into the 1980s in America? Teenagers and their emerging problems? Relationships? The film as a bit deeper than the ordinary American comedies about teenagers?